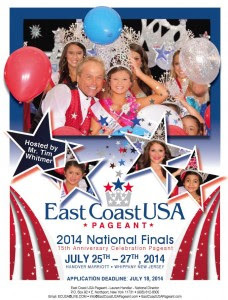 The East Coast USA National Finals is one of the most prestigious pageants in the country! It’s a fun family oriented weekend filled with all of the glamor and excitement pageantNationals-2014ry has to offer. You do not need to have participated in a prior pageant to attend. We award many National titles to both Pro and Novice contestants. Every contestant who attends our National Pageant leaves with gifts and a custom crown! Just for giving the competition their very best! The weekend offers fun parties, opportunities to make new friends and an experience you will never forget!